Michael Roads and his late wife Treenie were crucial catalysts in the unfolding of the Bird Card story. Joyce and I both independently attended a number of their retreats exploring the metaphysical nature of reality, although we didn’t actually meet there. 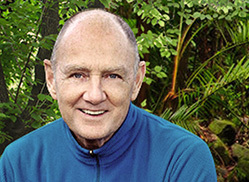 Treenie died in 2006, and Michael and his present wife, Carolyn, still run metaphysical intensives all over the world teaching about Love and about the metaphysics of Nature and humanity. What a wonderful partnership we have in this presentation. First there was Jane, with her ability to cross the membrane between the physical and metaphysical expressions of bird consciousness; and then came Joyce, with her ability to attune with, and perceive, the bird consciousness, expressing this with her beautiful, descriptive pictures. I want you, the reader, to know just how rare this is. Two people attuned to the same vision, the same purpose, the same intent, both synchronised together into a seamless Whole. As some of you may know, Nature was/is my teacher. I have the ability to ‘listen’ to the silent words that flow from Nature. This is a simple process, but not easy. Listeners are required to close down all their own concepts, ideas, beliefs, expectations, and knowledge about Nature, enabling themselves to become purely receptive and responsive. Too often the listener’s own agenda gets in the way, such as fears and worries about world events, or anger at perceived ecological destruction. If a person believes that humanity or Nature must be ‘saved’, and has a desire to ‘help’ in this process, then the ability to ‘listen’ is so diluted as it filters through desires and concepts that the resulting words are no more than an echo of the listener’s beliefs. Jane fell into none of these traps. She listened. She was enthralled, enthusiastic, excited, bewildered, and happy, and she had no idea initially where it was all leading to, or why. Joyce came into the picture – literally! – in perfect timing. Her current project had just finished, and she and Jane were put in touch with each other by a friend. Although during the whole time Joyce envisioned and created the cards they had yet to meet physically, they certainly met and connected on the required level of consciousness. Just as I had been inspired by the quality and insight of Jane’s words, so I was powerfully impressed by the quality of Joyce’s visual interpretation of each expression of bird energy. Again, I cannot help but emphasise that this is a rare combination. Both Jane and Joyce have put aside their personality packages and have attuned on a high and distinctly clear level of communication with both the Book and the Cards. Both the words and the pictures are inspirations of communication. Communication comes on many levels; it can be intellectual, boring, aggressive, demanding…the list is long, but really to connect, communication needs to involve the heart. Long after the head has forgotten, the heart remembers – and acts. This is the class and this the quality of the Bird Cards and Book communication: as a package they are definitely heart quality, heart expression. I thoroughly recommend the Bird Cards and Book, and I suggest that you use them with receptivity and openness, allowing your own inner response to emerge. Don’t so much ‘do’ with them, rather … ‘be’ with them!